Let’s start with a very important one: write about things that interest you. It’s hard for any writer to write about something they have no interest in. You can’t read a book if you’re not enjoying it, can you? Same with writing. Stick to what really fires you up, and you’ll find the writing will flow much more easily. 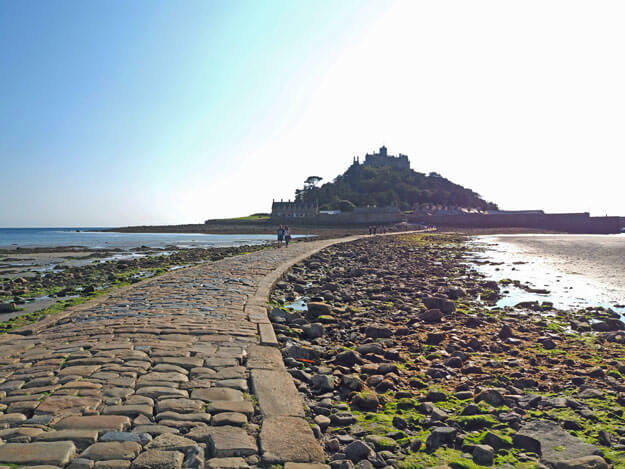 I had heard about a place in Cornwall called St Michael’s Mount, where there’s a castle on an island that is sometimes attached to the mainland and sometimes completely cut off by the sea. It fired my imagination so much that I went to visit. And then I wrote a book about it! Emily Windsnap and the Castle in the Mist came out of this – and all because I loved the idea of this place. I have a rule for the early stages of your story or poem or book. It’s this: Don’t get it right; get it written. What this means is – when you start writing your story, don’t worry about spelling or grammar. Sometimes you find there’s a little devil sitting on one shoulder commenting on your work as you write. ‘You’ve spelt that wrong. That should be a full stop not a comma,’ etc etc. Have you ever had this devil sitting on your shoulder? Well, hit his ‘mute’ button, so he’ll leave you alone to write. At the early stages, you don’t want anything to interrupt the flow. You can fix all that later. Get yourself a notebook. Part of the joy of being a writer is that you have a great excuse for wandering around lovely stationery shops. (If you’re already a stationery fan, you’re halfway to being a successful writer already!) 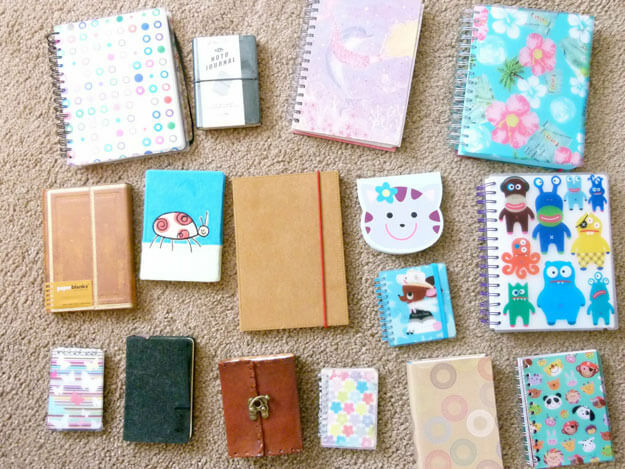 Try to find a notebook that’s small enough to carry around in a pocket or bag. Ideas are pesky little critters and they come to you at the oddest times. If you always have your notebook nearby, you can grab them and write them down before they flit away. Here are a few of my favourite notebooks. Show your work to others. This one is tricky because you have to be careful about who you choose. You want someone who you trust to tell you the truth – but who will do it nicely. If you’re in any doubt, try this test on them. Put on an item of clothing that you know looks awful on you. Then ask your friend/teacher/auntie what they think of it. If they say ‘Darling, you look wonderful!’ you know that they’re too busy worrying about your feelings to give you the hard truth. If they say ‘Horrendous!’ they’re no use either, as they’re not caring about your feelings enough! If they say, ‘Well, the colour suits you, but the shape doesn’t really do much to emphasise your gorgeous figure,’ then bingo! You have found yourself a trustworthy – and kind – critic! I’d better put this one in here, just so we’re clear. If you are planning to send your work off to a competition, a magazine, or even a publisher, send out your best work. This is the stage where you do have to worry about the spelling and grammar. Not because you have to blindly follow rules, but because you want to make your story as easy and fun to read as possible – and that’s what grammar does. So, once you’ve finished your first draft, go back to the beginning and work on it. Then do that again. And maybe one last time. When you’re sure you’ve got it into the best shape you possibly can, it’s ready to share! If your manuscript hasn’t looked like this at SOME point, you clearly haven’t done enough edits! Go back and do ONE more before you send it out. Remember, you only have one chance to make a first impression – and with agents and editors, that first impression really counts. Be patient. When you’ve sent your work off, you’ll want to hear back tomorrow! It’s not going to happen – so don’t sit by the phone waiting. Editors, magazines and competition judges take quite a while to get back to you. So send your work off and then try to forget about it. Best way to do this is to get writing something new! Right, this one’s a biggie. Believe in yourself. No matter what anyone else says about you, your writing, your ambitions or anything, the first person who you have to convince is yourself. I know it sounds cheesy, but achieving your dreams is not something that only happens to others. It can happen to you. You’ll have to work hard if you want to achieve it, but it is possible. And right now, you are brilliant exactly as you are. Believe it! Don’t follow someone else’s rules. Even these ones. There are ten tips here. Maybe you only agree with three of them. Great. Ignore the rest! It’s about what works for you. Lots of people will tell you that you have to do it this way or that way. You don’t. You have to do it your way. That’s all. It might take a while to find out exactly what your way is, but once you’ve found it, stick with it! It took me five books to figure out what ‘my’ way was. But now I’ve found it, I’m happier with my writing than ever before! Most important of all: Have fun! Yes, sometimes writing is hard, but it should be fun, too. If it isn’t, do something different! Life is here to enjoy, and if writing is one of your ways to do that then go for it! But if it isn’t, try lots of other things out until you find something that really excites you. And if you can’t find anything, just keep looking. There’s always a journey and a search – whether for a story or a new hobby or anything – and finding your way there is part of the fun! Here’s me having double-fun. 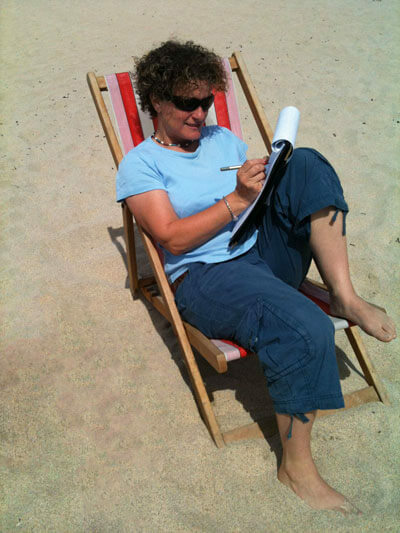 Writing AND being on my favourite beach. Win-win!